My enthusiasm for this art form, apart from its galvanizing effects, stems from personal and scientific evidence. At a personal level, I started this experiment in the shower. Fascinated by the fluency and brilliance of Jay-Z, I attempted to replicate his prowess. However, the first experience was deflating and disappointing to say the least. I was not half as cool, and my mind seemed to be stuck in some kind of “wannabe” land where my authenticity was compromised. Despite this initial hiccup, I persevered. In doing so, I realized that rap offered me an opportunity for self-exploration and expression that I had not anticipated. It demanded that I connect with something I felt passionate about, and with a few rules about timing and the permission to sound idiotic at first, I was on my way. Scientific research demonstrates that freestyle rap might boost your brain’s creative power, too, and when it does, it can free you from boredom and stagnation and offer you a reprieve from the monotony of everyday tasks. Here’s how. 1. You learn to let go. In 2012, brain researcher Siyuan Liu and his colleagues compared freestyle rap to rehearsed rap in native English speakers to see how their brains operated under both conditions. When you perform a rehearsed act, the lateral prefrontal cortex (PFC), which is instrumental in thought control and recall, is activated. But they found that for more spontaneous singing, the lateral PFC was deactivated because you rely more on strong emotions to find the right language without the distraction of prepared melodies. Moreover, the deactivations were stronger on the right side of the brain, while activations increased on the left. When your brain is deactivated like this, you’re no longer under the control of your thoughts. Rather, you surrender to the flow of thoughts and emotions that you experience. Called creative surrender, this occurs when you train your brain’s unfocused circuit to override your focused brain. When trying to complete a task, your focused brain is essential. But for creativity, your brain must go into regrouping mode to avoid habits and form new ideas. Freestyle rap will train you to access this capacity in your brain. In turn, you’ll learn to loosen your grip on predictability and find calm in uncertainty. 2. You gain access to powerful words. During this rap study, left-sided brain regions responsible for language and movement were also activated. This region is usually triggered by the act of speaking, so there was no surprise that rapping had the same effect. However, freestyle rapping causes this region to be activated above normal, which indicates that something special occurs. Freestyle rap requires you to find novel words and phrases that rhyme. This search for unique language patterns is a way to train your brain to become more creative. However, words are not all the same. Poetry, for example, allows your brain to let go of old ways of communicating, find fresh approaches to describe things, and connect with people. By integrating the poetry of freestyle rap into your everyday routine, you will add emotional weight to your words, allowing you to communicate more effectively and accurately. 3. You become a captivating speaker. The rehearsed and freestyle rappers in the study had no difference in movement. They produced the same number of syllables, and the primary movement areas in the brain were similar in both groups. However, there was a greater involvement of secondary movement areas in freestyle rap. When secondary movement areas are engaged, the movement is more enriched. This is similar to the way an inspired figured skater moves as opposed to a well-rehearsed skater who executes technically but without the same exquisite sense of timing. Secondary movement in rap reflects the demand in rap speed, the rushed need to find the best words, and the way such words fit within a rhythm. When leading a quarterly review meeting or networking with peers, you often want to express yourself with greater speed to catch someone’s attention or create a bigger impact. Consequently, when you are caught in a bind, your dabbling in freestyle rap can help you be faster in response, articulation, and engagement. 4. You find emotional richness and motivation. To understand the connections between the different brain regions, the researchers of the study expanded to further analyses. The results indicated that freestyle rap requires the brain to access special regions involved with emotion, motivation, and drive. This makes sense when you think about the emotional intensity behind Eminem’s music and Jay-Z’s rap tracks that require them to rapidly synthesize information and storylines. In this way, freestyle rap reminds you to invest in what you truly care about. Rather than function like an automaton in your day-to-day life, you can put your unique spin on things. For example, when I studied brain science in a laboratory, it was not the actual science that motivated me. Instead, I found beauty in the brain images and excitement in the statistical tests and processes. These emotional motivations allowed me to stay on task and finish my work. In the same vein, freestyle rap can help you recognize the value you find in your work, whether it is highly technical or more down to earth. Hopefully by now you’re ready to invest some time in freestyle rapping throughout your daily routine. 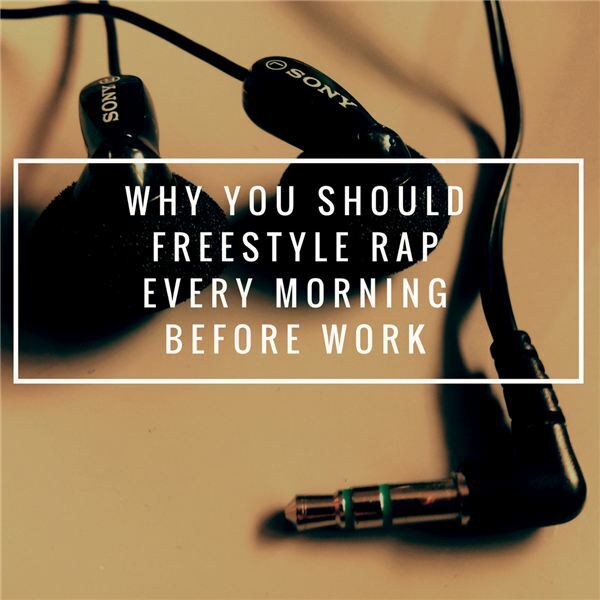 Whether you’re looking to let go of your need for control, utilize more powerful words, strengthen your speaking skills, or tap into your emotional values, freestyle rap will likely boost your creativity and drive in the workplace and beyond. So, step out of your comfort zone and drop some verses because you have much to gain and little to lose. Srini Pillay, M.D., is the CEO of NeuroBusiness Group and the award-winning author of numerous books, including “Tinker Dabble Doodle Try: Unlock the Power of the Unfocused Mind," “Life Unlocked: 7 Revolutionary Lessons to Overcome Fear," and “Your Brain and Business: The Neuroscience of Great Leaders." He also serves as an assistant professor of psychiatry at Harvard Medical School and teaches in the Executive Education Program at Harvard Business School.